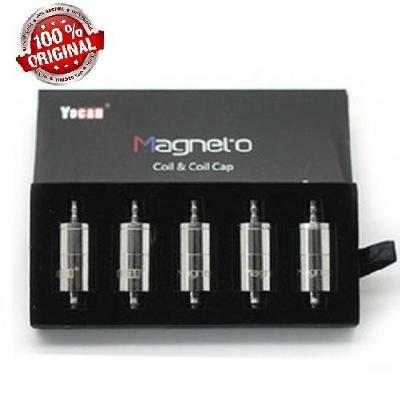 Yocan is a leading name in the vaping industry and if you have got one of those products and you are looking for replacement coils that actually work then you can’t do better than 100% Original Yocan Magneto Replacement. In this deal, you will get Coils 5 Pcs with Cap. Apart from fitting perfectly with Yocan, it fits flawlessly with Yocan Evolve Plus as well. Mentioned features include a Dab Tool Built into Coil Cap. You can use the dab tool to grab the wax before snapping the tool and cap back onto the coil. It is a Revolutionary Ceramic Miracle Coil and has the resistance of 0.6ohms. It is not a tobacco product and is suitable only for aromatherapy use. You can trust this product to speed up the vaping process and enjoy a clean and strong quality of vapor. This is a perfect replacement for old burnt out coils that don’t work smoothly anymore. Replacement coil with magnetic dab tool coil cap for the Yocan Magento. This replacement coil is an instant hit. The first pack that I had purchased lasted for about 4 months, this is the second time I buying it. A good product indeed! I just liked the smoothness of the ceramic coils. Overall performance is satisfactory. The magnetic caps are also an added benefit. It is a great accessory for vape pen. No issues faced. A decent replacement coil. I had purchased it on urgent basis online and was not sure of the quality. To my relief the quality is good and these coils have exceeded my expectations. It works great and also has a very smooth and polished look. I assume one pack would last for at least 6 months if used properly. Altogether a good buying experience with Yocan. I got the best deal at this price as the replacement coils worked very well for my vape pen. Also the delivery was 2 days before the estimated delivery date been given which is a great service. I used to shop for replacement coils from local stores, but they never met my expectations. This is the first time I had purchased them online as I found it much cheaper and with same quality. I have just received the coils. The packing is so neatly done and coils have great finishing and look. I could not resist myself from giving a review. I hope they even perform well. I have ordered them twice and every time I received the same best quality coils. If you want genuine coils, best these! I would highly recommend it to people who like to use something original and the best things. Super fast delivery, excellent coil quality, good price and prompt customer query resolving. They are exactly same as described. I am very happy with these replacement coils. I would buy them regularly. My friend had ordered these replacement coils on behalf of me. I am quite impressed with the performance and its quality. One coil lasts about 3-4 weeks, even when I use them regularly. Keep it up.